Here are the top five items from the last month. 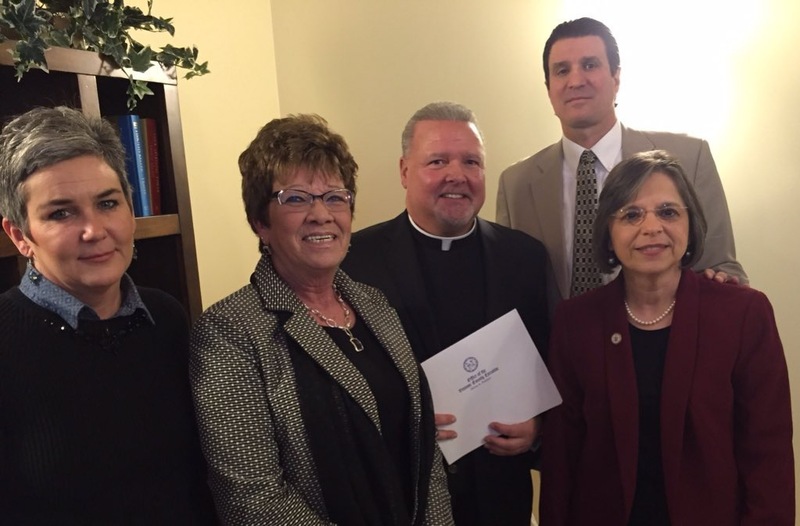 This past Sunday I attended the grand opening of Mercy House in Endicott. This center provides end of life care for terminally ill patients; from personal experience I know how valuable this resource will be for our community. I was able to secure $250,000 in capital funding for renovations that helped transform the former St. Casimir’s Church into a ten-bed home staffed by both professionals and trained volunteers. Mercy House provides hospice care to patients who cannot remain in their own homes, allowing them to rest comfortably surrounded by family members and people who care. It is equipped with a kitchen, library, chapel, and other amenities for residents and their families. Each resident will have their own room for comfort and privacy, and 24-hour care will be provided on site. For more information, or if you’re interested in volunteering, call 607-321-1857. (l to r) Village of Endicott Trustee Eileen Konecny, Broome County Executive Debbie Preston, Founder of Mercy House Fr. Clarence Rumble, Mercy House President Anthony Paniccia, and Assemblywoman Lupardo at the grand opening of Mercy House. Engaging children early in life and keeping them involved outside of the classroom have shown to make them more ready for college and careers later in life. As the Chair of the Assembly Committee on Children and Families, I’ve been advocating for quality, affordable child care and expanding afterschool opportunities over the last several years. 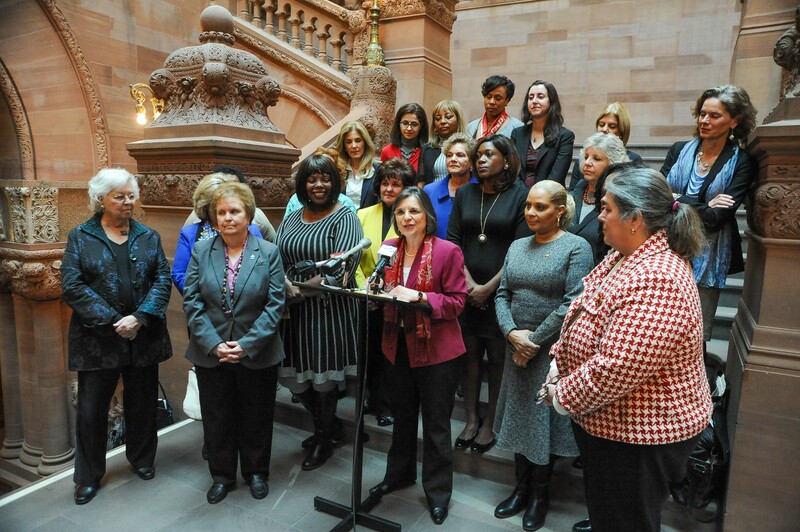 This year, these efforts are getting a boost from the Legislative Women’s Caucus (LWC), a bi-partisan group of the 54 women legislators in New York – a group which I also chair. Before the start of our session, members of the LWC were polled to decide where the Caucus should focus its work. These two topics were chosen and were unveiled at a news conference in Albany on February 8th. The needs surrounding child care are especially important during our current budget negotiations as new federal mandates have created a major funding gap in New York. I raised these concerns at a Human Services budget hearing on February 9th; they were also detailed in a guest viewpoint I recently wrote for the Press & Sun-Bulletin. You can read that column by clicking here. Assemblywoman Lupardo, Chair of the Legislative Women’s Caucus (LWC) and fellow members announce their top priorities for 2016. There’s just about a month and a half left before tax returns are due. As you prepare your taxes don’t forget about a number of credits that are available that could save you thousands of dollars. For a list of credits for which you may qualify, click here. There is also free assistance available for those who may need help preparing their taxes. The Volunteer Income Tax Assistance (VITA) program provides free tax preparation services to individuals and families with annual incomes of $54,000 or less, people with disabilities, the elderly, and those with limited English skills. For those 60 years of age and older, the Tax Counseling for the Elderly (TCE) program can also provide assistance at no cost to you. To find the nearest VITA or TCE site, visit this website or call 800-906-9887. If you’d like to get your return quicker, you are also encouraged to file electronically. 92% of all New York filers already file electronically; it’s safe, accurate, and easy. In fact, the error rate for e-filed returns is 20 times lower than for paper returns. And, if your combined income for 2015 didn’t exceed $62,000, you can e-file for free. For a list of free e-filing times and locations click here. -The New York State Department of Environmental Conservation will hold a public meeting to inform people about continued efforts to reduce groundwater and vapor contamination at the former IBM Endicott facility. Click here for more information. -This conference is out of town but is very valuable for veterans looking to start a new business or expand a current business. Click here for more information and to register. -This meeting is a collaboration of higher education, government, and the private sector to discuss the latest opportunities surrounding economic development in our area. For more information and registration, click here. If you live in the 123rd Assembly District, you should have received my annual Constituent Survey earlier this month. This is the fifth time I’ve polled residents and each year the response has been tremendous. I encourage you to fill out the survey as it helps guide my work as your representative in Albany. As always, there are two ways you can submit your response: by filling it out and sending it back to my Binghamton office by mail; or by filling it out online, which can be done by clicking here. I hope you will consider submitting it electronically, as it will save you a stamp, cuts down on paper waste, and helps us get you the results quicker.